It sounds like you little TX/RX is working ok. Was it the decoupling I suggested that solved the strange audio response you had previously? Anyway, time now to make a permanent job of it. Hi. Hi Maurice. I think the decoupling might have helped a bit, but the audio still disappears below about 1KHz. It isn't helped by the crystal earpiece which has very little bass response. The recording probably made it sound better than it is. 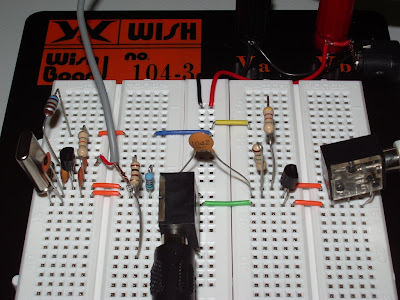 Fortunately when the trimmer capacitor is switched out on receive the oscillator frequency is quite a long way below the transmit frequency so anyone who replies on your frequency should be quite high pitched and easy to hear - if you can pick them out of the crowd, that is! I set up a webpage about the transistor if anyone is interested.